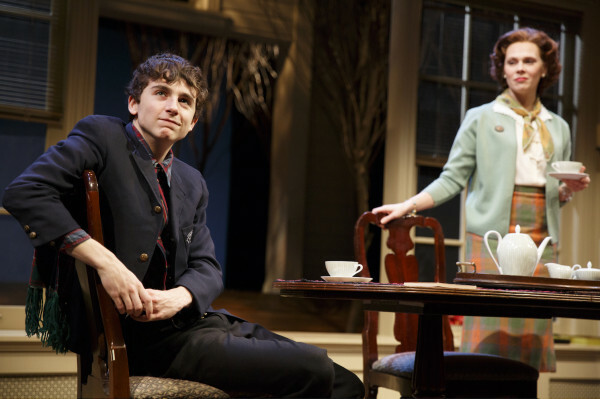 Timothée Chalamet and Annika Boras in Prodigal Son at New York City Center Stage 1. Photo: Joan Marcus. What if Holden Caulfield weren’t kicked out of prep school? What if, moreover, he were taken almost entirely seriously by the adults around him? That is, essentially, the sort of scenario envisioned in John Patrick Shanley’s Prodigal Son. The Caulfield character, in this case, is Jim Quinn (a masterly Timothée Chalamet), the precocious yet painfully insecure product of a blue-collar family from the Bronx who manages to wrangle a scholarship to a Catholic New Hampshire boarding school. As prone to quote poetry and wax romantic about the human condition as he is to beat up fellow students, steal and get drunk, Quinn is a challenge, and a curiosity, for his teacher Alan Hoffman (Robert Sean Leonard) and principal Carl Schmitt (Chris McGarry). When they’re not threatening or punishing their problematic star student, they’re inflating his already massive but fragile ego. His allure, it seems, is undeniable. “He’s the most interesting mess we have this year,” Schmitt tells Hoffman. In the annals of fictional prep schools, from A Separate Peace’s Devon to Dead Poets Society’s Welton Academy — of which Leonard, coincidentally, is an alum — interesting messes are a staple. They usually don’t fare well, if, indeed, survive at all. Quinn, on the other hand, seems to emerge virtually unscathed from the tumult of these formative years, buoyed by the fact that Schmitt and Hoffman, however begrudgingly, yield to him — spellbound, apparently, by the power of his profound but boyish intellect. In this memory play of sorts, the grown Quinn is allowed occasionally to step out of the action and remark on the drama. The distance, one might imagine, would allow him to see his own naivety. No such luck. The adult Quinn seems to be as reverent of his teenage self as his teachers, offering, in between fond remembrances, the vaguest of reflections: “I was fifteen. Do you remember fifteen?” A rare bit of insight, which bookends the play, is that he considers this period in his life “a special, beautiful room in hell.” Prodigal Son succeeds in evoking the beauty and the hell of the young man’s coming-of-age, but a few more steps back could better put its specialness into perspective. Prodigal Son is on until 27th March 2016. Click here for tickets.